You are enveloped in what feels like a too-hot blanket every time you get in the car. Potato chips and watermelon count as lunch, ice cream counts as dinner. The air is so still that you can hear your friends laughing in the backyard from a block and a half away. Bedtime? What's that? Too many nights are spent sitting around a fire, solving all of the problems of the world. The days go on forever but still seem to end too quickly. Backgammon is a perfectly good way to spend hours of the afternoon. Sugar Snap Peas start disappearing from the farmer's markets and in their place: STRAWBERRIES! Make this salad now, before it's too late! Bring it to a BBQ and prepare for everyone to instagram it. It's so gorgeous that you will look like a Top Chef even though it's just a few simple, fresh ingredients prepared with care. First, prep the Sugar Snaps. Remove the string by pinching the 'stem end' with your thumbnail and pulling the string off. Rinse, allow to dry on a paper towel then slice into thin strips lengthwise (it's okay if the peas pop out!). To make this ahead of time: Place sliced sugar snaps in a dry bowl covered with a damp paper towel in the fridge until ready to serve. In a small bowl (or bullet style blender), whisk together the buttermilk, yogurt, juice of two lemons, salt and pepper. Pour into the bottom of the bowl you are serving the salad in. 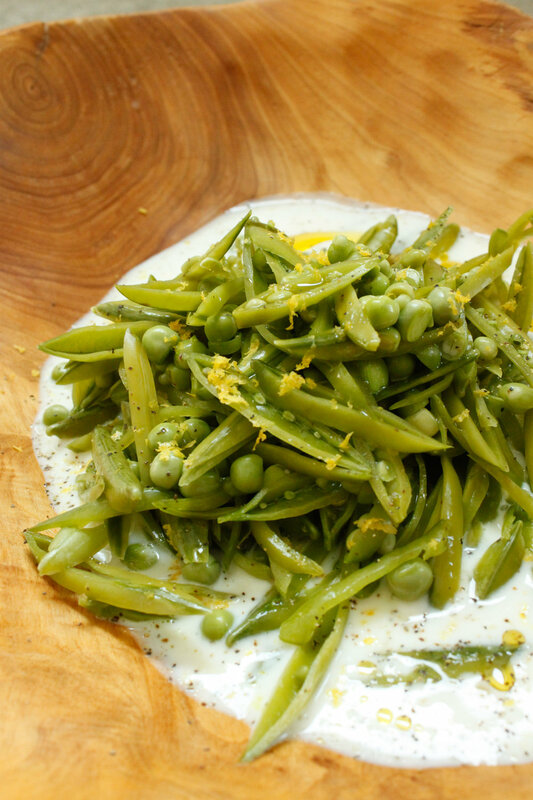 Toss the sugar snaps with 2 TBSP olive oil, remaining juice and zest of the third lemon, salt and pepper. Serve over buttermilk dressing with tongs! To enjoy this salad the next day, squeeze another half a lemon over the top to brighten it up and it will be as good as new!